This image of the solar corona during the 2001 total eclipse is the processed composite of eight images with various exposition times. The resulting image has 1.6 MB in PNG format but the input data set is of about 4 GB. Each input image is of 8900 × 8900 pixels resolution and 48 bits per pixel dynamic range. 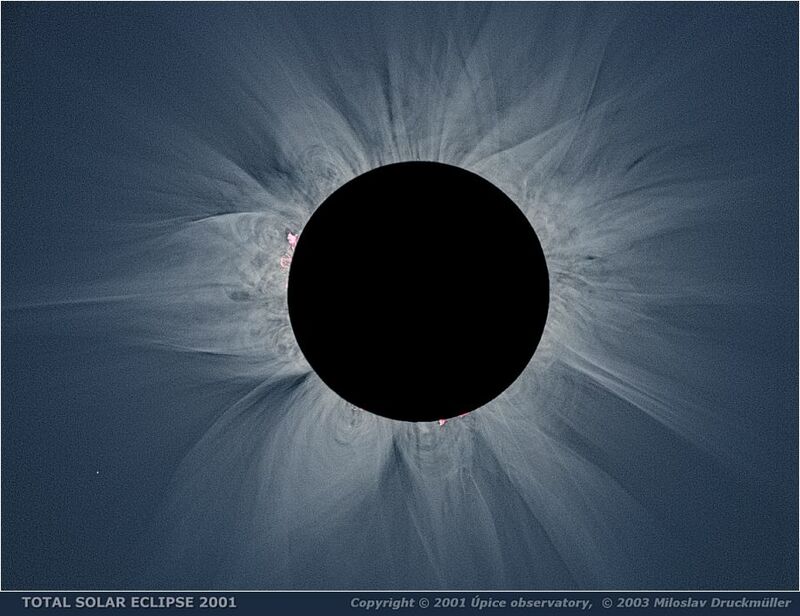 The first step of the image processing was rotation of images in order to compensate errors caused by scanning and possible errors in tracking during eclipse. The angle of rotation was measured by means of special program (PhaseCorr 2.0) created by author of this Web pages specially for this purpose. The program uses Fourier transform and modified phase correlation technique. The second step is translation of images. The translation vectors were found by Sofo ACC 5.0 Analyzer - Match II Module using relatively bright star 1 Geminorum (approx. 4th magnitude), which is visible in the bottom left part of the image. This star is not visible in the images with the shortest exposures even after special processing and therefore significant features in chromosphere and prominences were used for translation vectors determination, too. The precise registration of images is very important for achieving maximum image resolution. The high resolution image presented on this page is resized to 1/6 of resolution of original scanns and the registration is of subpixel precision i.e. the quality of presented image is not negatively influenced by registration errors of images. After registration of images the sum of all images was created. The sum of the images contains a lot of information which is invisible because the image has more than 65 thousand brightness levels for each RGB component and the computer monitor is able to display in the best case only 256 brightness levels of each color component. Even if the monitor was able to display more brightness levels it would be useless because the human eye watching a standard computer monitor is not able to distinguish more than about 200 brightness levels. The only way how to visualize the invisible structures in corona image is to use mathematical tools inspired by human vision. A human eye is definitely not a camera measuring light intensity for each picture element. The human eye is a differential analyzer comparing brightness of a point with that of its neighborhood. It has an excellent ability of comparing brightness especially of near picture elements but it has no ability of measuring the absolute brightness. The resulting image we see is the result of sophisticated "mathematical processing" of differential measurements done by "software running in our brain computer". The picture we see is a sort of "virtual reality" generated by our brain which is continuously updated according to incoming measurements. Another very important feature of human vision is adaptivity. An eye has the ability to change the focusing, sensitivity, contrast, color calibration and many other parameters during the observation and even more - the "image processing" may be changed according to local properties of the observed image. Mathematical methods inspired by these properties of human vision are generally called adaptive filters. A correctly constructed adaptive filter can modify high contrast image with high dynamic range in such a way that it can be displayed on low contrast display like computer monitor and create an image relatively similar to what could be observed directly by human eyes. Of course the sensation will be never identical to reality because the human vision has the ability to estimate the contrast which is on the computer screen significantly lower than in reality. Presented image is processed by special program (Corona 2.0) created by the author of these Web pages which uses so called adaptive convolution. The processing is from the mathematical point of view the increasing the contrast on high spatial frequencies. It can be done by Fourier transform in frequency domain or by convolution in space domain. Both these methods suffer from edge effects caused by brightness function discontinuity on the Moon's edge. The problem can be managed by convolution with adaptive kernel and this method is used in Corona 2.0 software. Processing Sum of 8 images enhanced by means of adaptive kernel convolution.